Crates will contain a different slime-themed ornament every day between December 20 - 31st. New ornaments will begin to appear in crates at the stroke of midnight, local time. Hurry and collect as many as you can before they’re gone! Follow us on Twitter for each day's ornament reveal. Each crate has a chance to include one of three rare ornaments, so be sure to keep a spare vac tank ready in case one appears!! Remember that sweet stuff from Fangamer? Well, we're giving out the entire collection! We want to see you using ornaments and echos to brighten up the range by hanging them in trees and decking out your ranch. Show us your holiday display by tweeting us using #WigglyWonderland and you could win a Slime Rancher merchandise combo by Fangamer! You can enter to win daily during the event, so GIF, screenshot, and capture our hearts with your holiday spirit. But wait, there's more! All Twitter submissions will be entered to win a gift copy of Slime Rancher + Original Soundtrack, with a new winner selected daily. Jan 1 - LAST CHANCE! 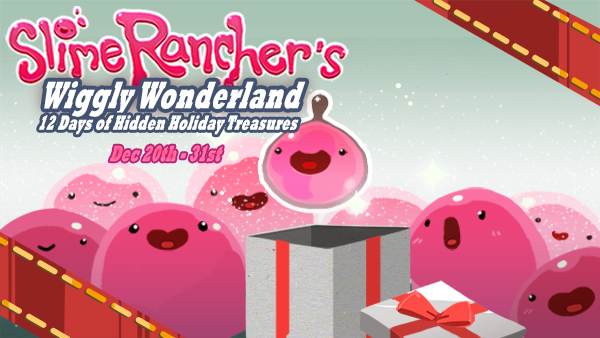 On January 1st, every crate will contain a random ornament of the 15 slimes featured during #WigglyWonderland!! Manually adjusting the system clock to time travel could cause problems with Slime Rancher's backup save system and Steam Cloud saves.